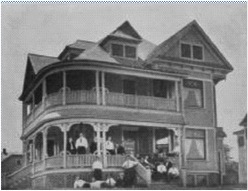 In the summer of 1900, Gamma Zeta chapter took one of the first steps toward solving their housing problem by renting a house at 505 East Green Street, just two blocks from the University. The brothers moved in when school began in the fall, and while the house represented a definite improvement in terms of location, it was not very well-suited to functioning as a chapter house. The 1920s history reported that it “had rooms of the most curious shape and of the most unheard of arrangement,” so while the brothers enjoyed being able to gather as a chapter, the quest for a real chapter house continued. 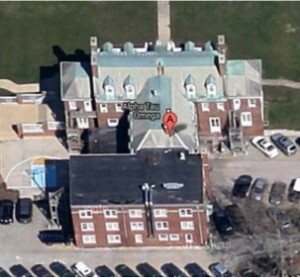 Several of the other fraternities existing on campus at the time were beginning to build chapter houses, so ATO recognized that they would be compelled to join the trend if they expected to compete for the “best” men. The fundamental basis of any large construction project is financial, and Gamma Zeta’s active and alumni members certainly recognized this fact. Wesley King, a founding member of the chapter and now an interested alumnus, was the first to work out a system of chapter house notes as funding for the construction of a new chapter house. In the spring of 1901 he persuaded twenty-three other alumni to sign these notes, which were worth $10 each for ten years. Later, all new initiates to the chapter were also asked to sign these notes in order to contribute to the future prosperity of the organization they were joining. Dwight F. Haussler was reportedly the first man to pay his note, which he sent from Germany in a fifty-mark money order that cashed in for $11.20. King’s fundraising efforts stretched over the next three years, as he worked to drum up more participation among the actives and alumni. 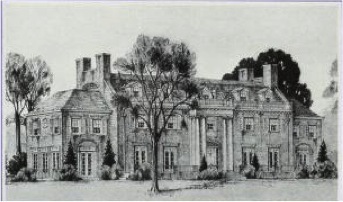 In the spring of 1904, King and other prominent alumni felt that there was enough support to move the project one step further, and organized a House Corporation to shepherd the complicated process of purchasing a lot, selecting an architect and contractors, and financing the entire undertaking. The first meeting of the House Corporation took place on March 16, 1904, and Walter Mueller was elected President, Wesley King took up the post of Secretary, and Thomas Arkle Clark became Treasurer. King had obtained a contract to purchase two lots at 405 East John Street in Champaign from D.H. Stolty for $3000, but he transferred the contract to the newly-formed House Corporation and the group voted its approval of the purchase at the first meeting. The rest of the spring and summer of 1904 passed rather quietly on the house front, consumed primarily with study and research into the best way to proceed with all the plans. At the last meeting of the year, on December 29, the Corporation decided that it would sell bonds up to the amount of $17,000 to finance the rest of the payments that would be needed for both the land and the eventual construction of the house. Despite this resolution, no more concrete action was taken toward the chapter house construction until almost one year later. By early 1906, however, activity began again in earnest and Gamma Zeta was very close to realizing its dream of a comfortable gathering place for actives and alumni alike. Beginning in February 1906, the House Corporation held meetings at least monthly and the minutes of these meetings report exciting developments. On February 5, C.H. Blackall of Boston (a graduate of the University of Illinois) was engaged as architect, and on March 12 the Corporation approved a “Colonial front” for the house in accordance with Blackall’s suggestions. On April 28 the Corporation’s Finance Committee under A.D. Mulliken was authorized to secure a loan of $12,000 from the Chicago Savings Bank to finance construction, and at the same meeting a decision was made to let the construction contract to A.W. Stoolman, whose bid of $17,187 was the lowest received. By May 23, a contract had been signed with Stoolman for the lower amount of $15,234, which excluded fees, heating, plumbing, and electrical fixtures, many of which would be handled by other contractors. Construction on the house started soon after this contract was signed and continued through the summer, when it must have progressed extraordinarily well judging from the absence of any exasperated correspondence dealing with construction delays or financial disputes. In fact, the 1920s history reports that by September the house was “practically ready for occupancy,” although a few more months’ worth of work still remained. One pressing problem not necessarily related to construction was furniture, as all the men involved with the house project agreed that the furniture from the rented house on Green Street and from the chapter’s current downtown Champaign rooms was not suitable for the new house. There was not, however, much money in the budget allotted specifically for furniture, so the House Corporation appealed to the alumni and many came to the rescue with earmarked “furniture” contributions. This was perhaps the first time, but by no means the last, that this “emergency” tactic was used to encourage alumni giving to Gamma Zeta in order to improve or repair its physical structure. Most alumni recognized the requests as sincere efforts to protect and strengthen the chapter’s investment in its most valuable possession, but throughout the years some expressed their annoyance at “constantly being asked for money,” and successful fundraising campaigns had to deftly negotiate these attitudes. “Wednesday: Approaching forces march on 405 John Street. Capitulation of the tribe. Triumphal march of victors. Tour of the premises. Thursday: Scouting parties to Alma Mater and other points. Burying of the hatchet in the fatted calf, said calf and trimmings to be devoured at 6:30pm with Thanksgiving. Destruction of tobacco, several pipes apiece. Friday: Campfires; with chestnuts raked out by many brothers, 4:30pm; Grand pow wow and dedicated of the big wigwam, 6:30pm; Love feast, with heap talk. More smoke. The housewarming weekend was certainly a time for “Thanksgiving” and was appropriately coordinated with this holiday, allowing a large crowd of active and alumni members the chance to see the fruits of more than five years of hard work on the part of some Gamma Zeta brothers. These men were working even in the midst of the celebration when they held a House Corporation meeting on November 30. During the meeting the members learned that an additional loan of $3,000 had been secured from William B. McKinley (a United States Senator and Congressman from Illinois who was of no relation to the twenty-fifth President of the United States), and that ninety-three of Gamma Zeta’s one hundred twenty-four members had aided the house construction effort with either donations or house notes, many of which were already paid in full. Wesley King proudly announced that Gamma Zeta “now owned a home which would last for no less than one hundred years.” His calculations could not, perhaps, account for the growth that the fraternity would experience in the next few decades, but the sentiment of King’s statement is clear: Gamma Zeta was now firmly established as a reputable and leading fraternity on the University of Illinois campus, and its new chapter house served as the most potent symbol of this permanence. 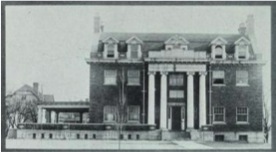 By the summer of 1926 almost all interested alumni agreed that the Gamma Zeta chapter house on John Street had grown too small for the chapter’s needs. At a meeting on June, 1926,the House Corporation authorized a committee to look into the possibility of purchasing new land on which to build a larger house.78 By the next June, the committee had arranged to purchase a lot for $5,800.00 on Second Street in the Fairland Place addition to Champaign, directly between the Deke and Chi Psi houses.79 This location, however, did not last for long, as the Corporation decided to trade in the Fairland Place lot for a larger one in the New Gallivan addition in Urbana, a transaction that was completed in the summer of 1928.80 Therefore, after three summers of preparatory work, by the fall of 1928 the House Corporation and the chapter as a whole was prepared to jump into the new building project in earnest. The first order of business, after purchasing the land for the new chapter house, was to find a buyer for the existing house on John Street. After several months of negotiations with both a local Presbyterian church and a smaller fraternity, Sigma Mu Sigma, the chapter concluded a deal with the latter organization to buy the land, chapter house, and selected furnishings for $55,000. The contract was signed with the Alumni Association of Eta Chapter of Sigma Mu Sigma on June 17, 1929. A letter from the House Corporation to E.I. Burke at Citizens State Bank in Champaign explained the terms of the sale, including that the difference between the purchase price ($55,000) and the loan obtained by Sigma Mu Sigma ($39,000) would be carried by the Gamma Zeta House Corporation as a second mortgage, payable within ten years. With this sale, Gamma Zeta moved into an exciting era of new growth but also a precarious financial one, as the chapter decided to make the move only a few months prior to the stock market crash that prefaced the Great Depression. Over the next decade, the financial position of the chapter grew increasingly complex and many of the House Corporation members, including most prominently Thomas Arkle Clark, found it necessary to place their own security on the line for the future good of the chapter. In December of 1929, Clark borrowed $35,000 from the Danville Building Association in order to partially pay for Gamma Zeta’s new lot in Urbana, modeling the kind of real-world “responsibility” that his fraternity system sought to teach its undergraduate members. This loan would be a source of anxiety to the House Corporation for many years to come, and when times were especially tight the Corporation appealed to all Gamma Zeta members – both active and alumni – to match the responsibility and fraternity loyalty demonstrated by Clark. In the lean 1930s, however, this challenge proved especially difficult to meet. Gamma Zeta alumni who experienced the lean years of the 1930s would likely look back on them as some of the most challenging yet most rewarding that the fraternity has ever faced. By the end of the decade the chapter was firmly installed in its new chapter house, this one likely to last for the one hundred years originally predicted for the house on John Street. The process leading to the new house on Pennsylvania Avenue, however, was fraught with tension and financial complexities that tested the resolve of even the most dedicated actives and alumni. In the midst of a nation-wide economic depression, the men of Gamma Zeta chapter of Alpha Tau Omega managed to secure their future and provide strong roots for the continued growth of their organization. Both building for the future and preserving the past seem to have been of great importance to the fraternity in the 1930s, as the chapter saved money to buy a movie camera begin recording events such as initiations, Founders’ Day, formals, and athletic contests. In January 1930 the active chapter asked alumni for help in purchasing a projector so that this invaluable Gamma Zeta “history” could be easily enjoyed on a regular basis. Although these 1930s films do no survive in the University of Illinois archives, the project clearly indicates a desire to preserve chapter history for future generations of Gamma Zetas, generations that the men of the 1930s hoped would appreciate their efforts to build a financially stable and widelyrespected fraternity at the University of Illinois. In November of 1929, Charles Harris of Danville had been chosen as the architect for the new chapter house. The new house was to repeat many of the Colonial design elements of the original chapter house on John Street, but was to be substantially larger in order to accommodate the growing fraternity. On April 7, 1930, Stewart Daniels was informed that the University District Building and Loan Association had awarded the chapter a loan of $50,000 to finance the construction of the new chapter house, and one day later Charles Harris wrote to Daniels with the bids for the house. English Brothers, with the lowest bid at $73,989, was awarded the construction contract, and the local firms of Apperson Brothers (heating), Square Deal (plumbing), and Standard Electric (wiring) rounded out the contracting team. After some small delays involving financing and contractual details, English Brothers began construction in the summer of 1930. In July, the House Corporation secured an additional $65,000 loan from the Danville Building Association, and during the fall House Corporation meetings decisions were made to purchase new furniture for the house from Carson Pirie Scott Co. of Chicago and to contract with Joseph Kaszab, also in Chicago, for cabinetry. This early correspondence is notable for its enthusiasm and optimism; as the different pieces of the chapter house project fell into place and Gamma Zeta moved closer to inhabiting its grand new home, the alumni steering the endeavor felt a palpable excitement. Although the House Corporation had originally hoped that the new chapter house would be completed by the fall of 1930, finishing work continued into the next year. In February 1931, Gamma Zeta Worthy Master Oscar Ogg, Jr. wrote to Claude Reno, ATO’s Worthy Grand Chief, and reported that the chapter house was “still quite unfinished.” Ogg hoped, however, that Reno would pay the chapter a visit once the new guest room was in order. 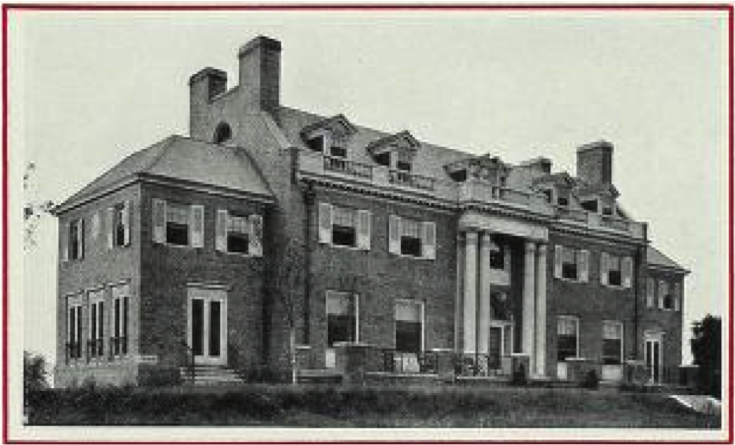 In the end, the Homecoming weekend in fall 1931 was set aside as “Homecoming and house-warming rolled into one,” and the active chapter promised to plan “Good Times, Not Long Talks” for the returning alumni who were eager to see the house. Instead of formal ceremonies, the chapter planned house tours, a buffet luncheon before the football game, and a very casual banquet in the evening. The scholarship issue also proved central to ATO’s efforts to expand the chapter house, a movement that had been underway since 1954 when the fraternity bought a tract of land from the University. 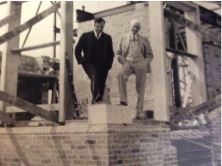 It took nearly four years for funding for the addition to be secured, so ground was not broken until October of 1958. Original bids on the three-story addition were far too expensive, so the plans were scaled down to a structure that would increase the house capacity to 74 men. The most important element in the new addition, as several chapter publications stressed, was the new study rooms which would enable the undergraduate members to improve their scholarship. The addition, which cost $165,000, would also provide a new kitchen and housemother’s quarters for Mrs. Marietta Klatte, who took over the position in the fall of 1959. The dedication of the Jack Powers Wing was a fitting end to a decade in which Gamma Zeta chapter had grown in both size and awareness of its position on the University of Illinois campus, in the process rededicating itself to campus involvement and scholastic achievement.